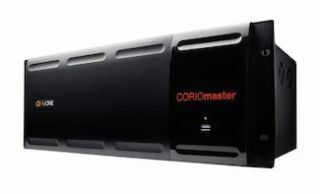 CORIOmaster video wall processortvONE unveiled the CORIOmaster and CORIOmaster mini 4K input & output modules and a new AV over IP module last week. CORIOmaster and CORIOmaster mini video wall processors offer ‘anything in, anything out’ capability, including 4K. With the new 4K and AV-over-IP modules, the processors can accept IP streams up to 1080p, 4K file playback via USB3.0, and 4K still images - all on one card, in one slot. tvONE also released its 1T-MV-8474 4K Multiviewer, the latest product in its range of 4K enabled products. The Multiviewer can display up to four video windows simultaneously via sixteen different fixed layouts, which can be recalled to present content in a variety of combinations. This could vary from a straight forward Quad split, Picture-In-Picture, Triple, Side-By-Side, Full screen or something more complex with multiple layers. tvONE will also demonstrate CORIOgrapher v2, the new version of its award-winning control software for CORIOmaster and CORIOmaster mini. CORIOgrapher v2 makes creation of custom video walls faster and easier to set up than ever, simplifying the management of collections of displays of diverse size, resolution and orientation. According to tvONE, CORIOgrapher v2 makes the process of creating video walls a creative pursuit with nearly unlimited freedom and flexibility. Also to be introduced at ISE is the new MultiView™ II Dual DVI-Tx Morph-It Card, a dual digital video transmitter card that is compatible with the MVII-DVI-Rx-1k receiver, plus the entire MultiView™ family of distribution and switching products including the Mondo-III matrix switch and the Morph-It powered backplane. MultiView DVI's most exciting feature is its full backwards compatibility with Magenta's best-in-class UTP-based crosspoint switch, the Mondo Matrix. Combining MultiView DVI with a Mondo Matrix provides integrators with the ability to implement digital video when utilizing one of the largest switches in the world, as the Mondo is configurable in increments of 16 inputs and outputs, from 16x16 all the way to 256x512. The tvONE C2-2855 high performance scaler is being shown with a new feature enhancement, Auto-Switching, which turns the scaler into a powerful standalone device. It allows the user to connect their source and have it automatically displayed on screen without having to press any buttons, simplifying BYOD connectivity. The resolution of the incoming video is quickly detected, analysed, and presented on screen. This new feature is particularly useful in situations where there is little or no technical supervision such as in meeting rooms, medical environments, teaching spaces or live staging events. tvONE's new 1T-CL-322 control panel will also be showcased throughout the booth as an easy to use and cost effective Ethernet based solution for system automation and remote control. The control panel consists of 15 LED backlit buttons, each programmable for either a single function or for recalling a sequence of commands in a macro. Each macro can be executed with a single button push, recalling up to 16 of the 128 stored commands, allowing the user to create and easily recall complex scenes or presets. tvONE’s latest products will be exhibited at this year’s ISE show in Amsterdam.